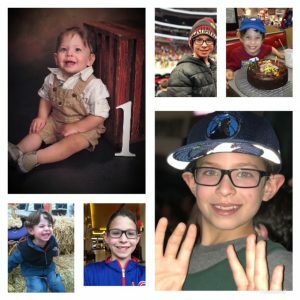 How is it possible that my first born baby is double digits? I’ve been a mom for a whole decade? player and a compassionate older brother (sometimes at least). It seemed like I was going to be battling temper tantrums, ants in your pants and sibling fights forever. And although the sibling fights may never subside, you’ve really blossomed into a special person. what you want and when you want it will make you very successful in life. Perhaps it’s even like looking into the mirror and facing some of the parts of my own personality. But I know that attitude is going to put you on a path to achieve everything you want in this world. that will enrich your life. I have always felt so fortunate to be able to experience your life front row. I’m sad that I will have to take a back seat on this next journey for you. I feel confident that this is an important time and you will come back with a stronger sense of self (hopefully not too strong) and the world past our front door. Happy Double Digits to the man who made me a mom. I love you so much! « « Five? How did that happen?